If you are looking for an electric toothbrush which is really going to deliver some serious scrubbing, Philips Sonicare is one of the top brands to consider. These brushes are renowned for doing a really thorough job, and are pretty intense. In fact, they are so intense that Sonicare includes an “Easy-start” feature to gradually boost the toothbrush’s power over your first 14 uses, just so you will not be overwhelmed. Many Sonicare brushes are firmly at the “expensive” end of the electric toothbrush price range. One which is closer to the middle of the bracket is the Philips Sonicare HX6511/50 Easy Clean. This toothbrush is by no means cheap, but it is certainly less pricy than the Philips Sonicare HX6932/10 FlexCare RS930, which I also recommend. Let’s take a look at the features of the Easy Clean! I gave it a try to see how it measures up in terms of performance, pros and cons. One thing I immediately liked about this toothbrush when I first picked it up was the slim, ergonomic handle, which is very comfortable and easy to hold. It is small, lightweight, and perfect for travel. The brush head is also reasonably small and does a great job. Interestingly enough, you can actually use the Philips Sonicare DiamondClean brush head with the Easy Clean! The DiamondClean brush head is superior, but otherwise the performance of the brushes is comparable. So purchasing the Easy Clean instead with the DiamondClean brush is a very smart way to upgrade it without paying the full cost of DiamondClean. The Easy Clean also includes a timing feature called the Smartimer. This feature alerts you when you have brushed the full two minutes that dentists recommend. Also included is the Quadpacer, which beeps every 30 seconds to let you know it is time to move to the next quadrant of your mouth. This is very helpful if you have a hard time knowing when you have brushed enough. Pushing the power button while you are brushing lets you “pause.” So long as you push it on again within 30 seconds, the timer will start where you left off. I have tested a number of Sonicare brushes, so I knew what I was in for in terms of intensity. My gums are in pretty good shape by this point in time, so it wasn’t too intense for me. Still, it surprised me after using an Oral-B brush for a while what a big difference it was. If you are not used to Sonicare, definitely make use of that Easy-start feature. Includes one ProResults brush head. Can remove up to 2x more plaque than a manual brush. Features Sonic technology which cleans your teeth with up to 31,000 movements every single minute. Comes with a charger base and travel cap, but no travel bag. Charge lasts for up to two weeks of daily use. Cost. As many buyers point out, the higher end Sonicare brushes use the same technology as this model. This model is lacking some bells and whistles, but you may not even need those extra features. Plus, you can just fit the DiamondClean brush head on it and get even better performance at a lower price. The slim compact handle is more comfortable than most other electric toothbrush handles you are going to encounter. The travel cap is hygienic and helpful. Of course, a travel bag would be helpful. Still, if you have a bag left over from another toothbrush model, that works too. A lot of models do not include a cap, and other caps won’t fit. So if I had to pick, I would rather the toothbrush came with the cap, just as it does. Most buyers said they were very happy with the attachment where the brush head fits on, and didn’t find a lot of buildup in there of gunk when they went to replace it. This was not a universal sentiment, but the fact that more than one customer mentioned it is a great sign. Personally, I can’t stand build up on or in my toothbrush, and a lot of gunk inside the attachment area can actually limit the lifetime of your electric brush before you have to replace it. And at this price, you want a brush that is going to last. Great performance, and especially helpful for getting your molars clean and reaching those hard-to-reach places. Despite being a Sonicare, some customers actually still said they have tried more powerful toothbrushes, and prefer them over this model. Some buyers reported that their Easy Clean failed them inside of a year. Thankfully Philips provides a one-year warranty on this toothbrush. According to customers who availed themselves of this warranty, Philips provides top-shelf customer service and is fast and cooperative to replace parts or the entire toothbrush as needed. 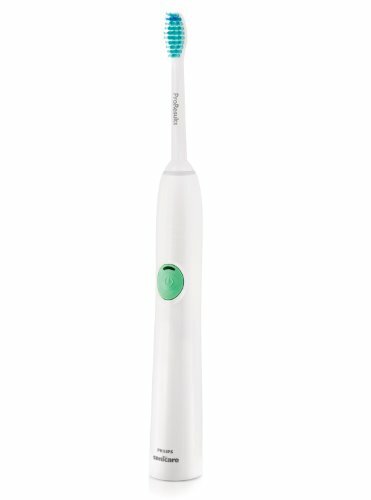 Is the Philips Sonicare HX6511/50 Easy Clean the right brush for you? I would say if you have really sensitive gums, this brush might be a little intense for you. Then again, I did run across customers with sensitive gums who said they like this product. As far as price goes, the Easy Clean really is right in the middle of the range. It costs more than a lower-end electric toothbrush, but it does a great job. It costs substantially less than the DiamondClean and other higher-end electric toothbrushes. The only drawback over the DiamondClean is the fact that you get fewer features with the Easy Clean. But if you do not need those extra features, you would be hard-pressed to find a better deal, especially since you can upgrade the Easy Clean with the DiamondClean brush head. So if you are interested in the Sonicare DiamondClean, but you are on the fence about it because of the price, the Philips Sonicare HX6511/50 Easy Clean is the perfect compromise.